A type of relay that can handle the high power required to directly control an electric motor or other loads is called a contactor. Solid-state relays control power circuits with no moving parts, instead using a semiconductor device to perform switching. Relays with calibrated operating characteristics and sometimes multiple operating coils are used to protect electrical circuits from overload or faults; in modern electric power systems these functions are performed by digital instruments still called "protective relays". Magnetic latching relays require one pulse of coil power to move their contacts in one direction, and another, redirected pulse to move them back. Repeated pulses from the same input have no effect. Magnetic latching relays are useful in applications where interrupted power should not affect the circuits that the relay is controlling. Magnetic latching relays can have either single or dual coils. On a single coil device, the relay will operate in one direction when power is applied with one polarity, and will reset when the polarity is reversed. On a dual coil device, when polarized voltage is applied to the reset coil the contacts will transition. AC controlled magnetic latch relays have single coils that employ steering diodes to differentiate between operate and reset commands. It was used in long distance telegraph circuits, repeating the signal coming in from one circuit and re-transmitting it to another. In 1809 Samuel Thomas von Sömmerring designed an electrolytic relay as part of his electrochemical telegraph. American scientist Joseph Henry is often claimed to have invented a relay in 1835 in order to improve his version of the electrical telegraph, developed earlier in 1831. It is claimed that English inventor Edward Davy "certainly invented the electric relay" in his electric telegraph c.1835. A simple device, which is now called a relay, was included in the original 1840 telegraph patent of Samuel Morse. The mechanism described acted as a digital amplifier, repeating the telegraph signal, and thus allowing signals to be propagated as far as desired. The word relay appears in the context of electromagnetic operations from 1860. 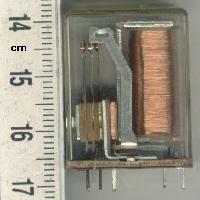 A small cradle relay often used in electronics. The "cradle" term refers to the shape of the relay's armature. 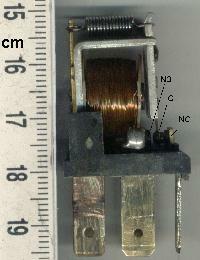 A simple electromagnetic relay consists of a coil of wire wrapped around a soft iron core (a solenoid), an iron yoke which provides a low reluctance path for magnetic flux, a movable iron armature, and one or more sets of contacts (there are two contacts in the relay pictured). The armature is hinged to the yoke and mechanically linked to one or more sets of moving contacts. The armature is held in place by a spring so that when the relay is de-energized there is an air gap in the magnetic circuit. In this condition, one of the two sets of contacts in the relay pictured is closed, and the other set is open. Other relays may have more or fewer sets of contacts depending on their function. The relay in the picture also has a wire connecting the armature to the yoke. This ensures continuity of the circuit between the moving contacts on the armature, and the circuit track on the printed circuit board (PCB) via the yoke, which is soldered to the PCB. If the relay is driving a large, or especially a reactive load, there may be a similar problem of surge currents around the relay output contacts. In this case a snubber circuit (a capacitor and resistor in series) across the contacts may absorb the surge. Suitably rated capacitors and the associated resistor are sold as a single packaged component for this commonplace use. Contact materials for relays vary by application. Materials with low contact resistance may be oxidized by the air, or may tend to "stick" instead of cleanly parting when opening. Contact material may be optimized for low electrical resistance, high strength to withstand repeated operations, or high capacity to withstand the heat of an arc. Where very low resistance is required, or low thermally-induced voltages are desired, gold-plated contacts may be used, along with palladium and other non-oxidizing, semi-precious metals. Silver or silver-plated contacts are used for signal switching. Mercury-wetted relays make and break circuits using a thin, self-renewing film of liquid mercury. For higher-power relays switching many amperes, such as motor circuit contatctors, contacts are made with a mixtures of silver and cadmium oxide, providing low contact resistance and high resistance to the heat of arcing. Contacts used in circuits carrying scores or hundreds of amperes may include additional structures for heat dissipation and management of the arc produced when interrupting the circuit. Some relays have field-replaceable contacts, such as certain machine tool relays; these may be replaced when worn out, or changed between normally open and normally closed state, to allow for changes in the controlled circuit. A contactor is a heavy-duty relay with higher current ratings, used for switching electric motors and lighting loads. Continuous current ratings for common contactors range from 10 amps to several hundred amps. High-current contacts are made with alloys containing silver. The unavoidable arcing causes the contacts to oxidize; however, silver oxide is still a good conductor. Contactors with overload protection devices are often used to start motors. A latching relay (also called "latch", "impulse", "bistable", "keep", or "stay" relays) maintains either contact position indefinitely without power applied to the coil. The advantage is that one coil consumes power only for an instant while the relay is being switched, and the relay contacts retain this setting across a power outage. A latching relay allows remote control of building lighting without the hum that may be produced from a continuously (AC) energized coil. Very early computers often stored bits in a magnetically latching relay, such as ferreed or the later remreed in the 1ESS switch. A mercury-wetted reed relay is a form of reed relay in which the contacts are wetted with mercury. Such relays are used to switch low-voltage signals (one volt or less) where the mercury reduces the contact resistance and associated voltage drop, for low-current signals where surface contamination may make for a poor contact, or for high-speed applications where the mercury eliminates contact bounce. Mercury wetted relays are position-sensitive and must be mounted according to the manufacturer's specifications to work properly. Because of the toxicity and expense of liquid mercury, these relays are now rarely used. Multi-voltage relays are devices designed to work for wide voltage ranges such as 24 to 240 VAC and VDC and wide frequency ranges such as 0 to 300 Hz. They are indicated for use in installations that do not have stable supply voltages. Electric motors need overcurrent protection to prevent damage from over-loading the motor, or to protect against short circuits in connecting cables or internal faults in the motor windings. The overload sensing devices are a form of heat operated relay where a coil heats a bimetallic strip, or where a solder pot melts, to operate auxiliary contacts. These auxiliary contacts are in series with the motor's contactor coil, so they turn off the motor when it overheats. This thermal protection operates relatively slowly allowing the motor to draw higher starting currents before the protection relay will trip. Where the overload relay is exposed to the same ambient temperature as the motor, a useful though crude compensation for motor ambient temperature is provided. A polarized relay places the armature between the poles of a permanent magnet to increase sensitivity. Polarized relays were used in middle 20th Century telephone exchanges to detect faint pulses and correct telegraphic distortion. (from top) Single-pole reed switch, four-pole reed switch and single-pole reed relay. Scale in centimeters. A reed relay is a reed switch enclosed in a solenoid. The switch has a set of contacts inside an evacuated or inert gas-filled glass tube that protects the contacts against atmospheric corrosion; the contacts are made of magnetic material that makes them move under the influence of the field of the enclosing solenoid or an external magnet. Reed relays can switch faster than larger relays and require very little power from the control circuit. However, they have relatively low switching current and voltage ratings. Though rare, the reeds can become magnetized over time, which makes them stick "on", even when no current is present; changing the orientation of the reeds or degaussing the switch with respect to the solenoid's magnetic field can resolve this problem. A solid-state contactor is a heavy-duty solid state relay, including the necessary heat sink, used where frequent on-off cycles are required, such as with electric heaters, small electric motors, and lighting loads. There are no moving parts to wear out and there is no contact bounce due to vibration. They are activated by AC control signals or DC control signals from programmable logic controllers (PLCs), PCs, transistor-transistor logic (TTL) sources, or other microprocessor and microcontroller controls. Solid-state relays have no moving parts. A solid-state relay (SSR) is a solid state electronic component that provides a function similar to an electromechanical relay but does not have any moving components, increasing long-term reliability. A solid-state relay uses a thyristor, TRIAC or other solid-state switching device, activated by the control signal, to switch the controlled load, instead of a solenoid. An optocoupler (a light-emitting diode (LED) coupled with a photo transistor) can be used to isolate control and controlled circuits. A static relay consists of electronic circuitry to emulate all those characteristics which are achieved by moving parts in an electro-magnetic relay. First we have the normally open, timed-closed (NOTC) contact. This type of contact is normally open when the coil is unpowered (de-energized). The contact is closed by the application of power to the relay coil, but only after the coil has been continuously powered for the specified amount of time. In other words, the direction of the contact's motion (either to close or to open) is identical to a regular NO contact, but there is a delay in closing direction. Because the delay occurs in the direction of coil energization, this type of contact is alternatively known as a normally open, on-delay. Since relays are switches, the terminology applied to switches is also applied to relays; a relay switches one or more poles, each of whose contacts can be thrown by energizing the coil. Normally open (NO) contacts connect the circuit when the relay is activated; the circuit is disconnected when the relay is inactive. Normally closed (NC) contacts disconnect the circuit when the relay is activated; the circuit is connected when the relay is inactive. All of the contact forms involve combinations of NO and NC connections. SPST-NO (Single-Pole Single-Throw, Normally-Open) relays have a single Form A contact or make contact. These have two terminals which can be connected or disconnected. Including two for the coil, such a relay has four terminals in total. SPST-NC (Single-Pole Single-Throw, Normally-Closed) relays have a single Form B or break contact. As with an SPST-NO relay, such a relay has four terminals in total. SPDT (Single-Pole Double-Throw) relays have a single set of Form C, break before make or transfer contacts. That is, a common terminal connects to either of two others, never connecting to both at the same time. Including two for the coil, such a relay has a total of five terminals. DPST – Double-Pole Single-Throw relays are equivalent to a pair of SPST switches or relays actuated by a single coil. Including two for the coil, such a relay has a total of six terminals. The poles may be Form A or Form B (or one of each; the designations NO and NC should be used to resolve the ambiguity). The S (single) or D (double) designator for the pole count may be replaced with a number, indicating multiple contacts connected to a single actuator. For example, 4PDT indicates a four-pole double-throw relay that has 12 switching terminals. EN 50005 are among applicable standards for relay terminal numbering; a typical EN 50005-compliant SPDT relay's terminals would be numbered 11, 12, 14, A1 and A2 for the C, NC, NO, and coil connections, respectively. Relays are used wherever it is necessary to control a high power or high voltage circuit with a low power circuit, especially when galvanic isolation is desirable. The first application of relays was in long telegraph lines, where the weak signal received at an intermediate station could control a contact, regenerating the signal for further transmission. High-voltage or high-current devices can be controlled with small, low voltage wiring and pilots switches. Operators can be isolated from the high voltage circuit. Low power devices such as microprocessors can drive relays to control electrical loads beyond their direct drive capability. In an automobile, a starter relay allows the high current of the cranking motor to be controlled with small wiring and contacts in the ignition key. Electromechanical switching systems including Strowger and Crossbar telephone exchanges made extensive use of relays in ancillary control circuits. The Relay Automatic Telephone Company also manufactured telephone exchanges based solely on relay switching techniques designed by Gotthilf Ansgarius Betulander. The first public relay based telephone exchange in the UK was installed in Fleetwood on 15 July 1922 and remained in service until 1959. The use of relays for the logical control of complex switching systems like telephone exchanges was studied by Claude Shannon, who formalized the application of Boolean algebra to relay circuit design in A Symbolic Analysis of Relay and Switching Circuits. Relays can perform the basic operations of Boolean combinatorial logic. For example, the boolean AND function is realised by connecting normally open relay contacts in series, the OR function by connecting normally open contacts in parallel. Inversion of a logical input can be done with a normally closed contact. Relays were used for control of automated systems for machine tools and production lines. The Ladder programming language is often used for designing relay logic networks. Early electro-mechanical computers such as the ARRA, Harvard Mark II, Zuse Z2, and Zuse Z3 used relays for logic and working registers. However, electronic devices proved faster and easier to use. Because relays are much more resistant than semiconductors to nuclear radiation, they are widely used in safety-critical logic, such as the control panels of radioactive waste-handling machinery. Electromechanical protective relays are used to detect overload and other faults on electrical lines by opening and closing circuit breakers. Several 30-contact relays in "Connector" circuits in mid-20th century 1XB switch and 5XB switch telephone exchanges; cover removed on one. Contact sequence — "make before break" or "break before make". For example, the old style telephone exchanges required make-before-break so that the connection didn't get dropped while dialing the number. Operating lifetime, useful life — the number of times the relay can be expected to operate reliably. There is both a mechanical life and a contact life. The contact life is affected by the type of load switched. Breaking load current causes undesired arcing between the contacts, eventually leading to contacts that weld shut or contacts that fail due to erosion by the arc. Coil current — Minimum current required for reliable operation and minimum holding current, as well as effects of power dissipation on coil temperature at various duty cycles. "Sensitive" relays operate on a few milliamperes. Assembly — Some relays feature a sticker that keeps the enclosure sealed to allow PCB post soldering cleaning, which is removed once assembly is complete. Expected mechanical loads due to acceleration — some relays used in aerospace applications are designed to function in shock loads of 50 g, or more. Size — smaller relays often resist mechanical vibration and shock better than larger relays, because of the lower inertia of the moving parts and the higher natural frequencies of smaller parts. Larger relays often handle higher voltage and current than smaller relays. Accessories such as timers, auxiliary contacts, pilot lamps, and test buttons. Stray magnetic linkage between coils of adjacent relays on a printed circuit board. There are many considerations involved in the correct selection of a control relay for a particular application, including factors such as speed of operation, sensitivity, and hysteresis. Although typical control relays operate in the 5 ms to 20 ms range, relays with switching speeds as fast as 100 μs are available. Reed relays which are actuated by low currents and switch fast are suitable for controlling small currents. As with any switch, the contact current (unrelated to the coil current) must not exceed a given value to avoid damage. In high-inductance circuits such as motors, other issues must be addressed. When an inductance is connected to a power source, an input surge current or electromotor starting current larger than the steady-state current exists. When the circuit is broken, the current cannot change instantaneously, which creates a potentially damaging arc across the separating contacts. Consequently, for relays used to control inductive loads, we must specify the maximum current that may flow through the relay contacts when it actuates, the make rating; the continuous rating; and the break rating. The make rating may be several times larger than the continuous rating, which is larger than the break rating. Switching while "wet" (under load) causes undesired arcing between the contacts, eventually leading to contacts that weld shut or contacts that fail due to a buildup of surface damage caused by the destructive arc energy. Inside the Number One Electronic Switching System (1ESS) crossbar switch and certain other high-reliability designs, the reed switches are always switched "dry" (without load) to avoid that problem, leading to much longer contact life. Without adequate contact protection, the occurrence of electric current arcing causes significant degradation of the contacts, which suffer significant and visible damage. Every time the relay contacts open or close under load, an electrical arc can occur between the contacts of the relay, either a break arc (when opening), or a make / bounce arc (when closing). In many situations, the break arc is more energetic and thus more destructive, in particular with inductive loads, but this can be mitigated by bridging the contacts with a snubber circuit. The inrush current of tungsten filament incandescent lamps is typically ten times the normal operating current. Thus, relays intended for tungsten loads may use special contact composition, or the relay may have lower contact ratings for tungsten loads than for purely resistive loads. An electrical arc across relay contacts can be very hot — thousands of degrees Fahrenheit — causing the metal on the contact surfaces to melt, pool, and migrate with the current. The extremely high temperature of the arc splits the surrounding gas molecules, creating ozone, carbon monoxide, and other compounds. Over time, the arc energy slowly destroys the contact metal, causing some material to escape into the air as fine particulate matter. This action causes the material in the contacts to degrade, resulting in device failure. This contact degradation drastically limits the overall life of a relay to a range of about 10,000 to 100,000 operations, a level far below the mechanical life of the device, which can be in excess of 20 million operations. For protection of electrical apparatus and transmission lines, electromechanical relays with accurate operating characteristics were used to detect overload, short-circuits, and other faults. While many such relays remain in use, digital protective relays now provide equivalent and more complex protective functions. Railway signalling relays are large considering the mostly small voltages (less than 120 V) and currents (perhaps 100 mA) that they switch. Contacts are widely spaced to prevent flashovers and short circuits over a lifetime that may exceed fifty years. Since rail signal circuits must be highly reliable, special techniques are used to detect and prevent failures in the relay system. To protect against false feeds, double switching relay contacts are often used on both the positive and negative side of a circuit, so that two false feeds are needed to cause a false signal. Not all relay circuits can be proved so there is reliance on construction features such as carbon to silver contacts to resist lightning induced contact welding and to provide AC immunity. Opto-isolators are also used in some instances with railway signalling, especially where only a single contact is to be switched. ^ Icons of Invention: The Makers of the Modern World from Gutenberg to Gates. ABC-CLIO. 2009. p. 153. ISBN 9780313347436. ^ "The electromechanical relay of Joseph Henry". Georgi Dalakov. ^ Scientific American Inventions and Discoveries: All the Milestones in Ingenuity--From the Discovery of Fire to the Invention of the Microwave Oven. John Wiley & Sons. 2005-01-28. p. 311. ISBN 9780471660248. ^ Thomas Coulson (1950). Joseph Henry: His Life and Work. Princeton: Princeton University Press. ^ Gibberd, William (1966). "Edward Davy". Australian Dictionary of Biography. Canberra: Australian National University. Retrieved 7 June 2012. ^ Mason, C. R. "Art & Science of Protective Relaying, Chapter 2, GE Consumer & Electrical". Retrieved October 9, 2011. ^ Riba, J.R.; Espinosa, A.G.; Cusidó, J.; Ortega, J.A. ; Romeral, L. (November 2008). Design of Shading Coils for Minimizing the Contact Bouncing of AC Contactors. Electrical Contacts. p. 130. Retrieved 2018-01-07. ^ Fleckenstein, Joseph E. (2017). Three-Phase Electrical Power. CRC Press. p. 321. ISBN 978-1498737784. ^ Croft, Terrell; Summers, Wilford, eds. (1987). American Electricians' Handbook (Eleventh ed.). New York: McGraw Hill. p. 7-124. ISBN 978-0-07-013932-9. ^ Rexford, Kenneth B.; Giuliani, Peter R. (2002). Electrical control for machines (6th ed.). Cengage Learning. p. 58. ISBN 978-0-7668-6198-5. ^ "Contactor or Motor Starter – What is the Difference?". EECOOnline.com. 2015-01-13. Retrieved 2018-04-19. ^ Zocholl, Stan (2003). AC Motor Protection. Schweitzer Engineering Laboratories. ISBN 978-0972502610. ^ Edvard (2013-03-09). "Working Principle of Thermal Motor Protection Relay". Electrical-Engineering-Portal.com. Electrical Engineering Portal. Retrieved 2017-12-30. ^ "Coordinated Power Systems Protection". Department of the Army Technical Manual. United States Department of the Army (811–814): 3–1. 1991. ^ a b A. C. Keller. "Recent Developments in Bell System Relays -- Particularly Sealed Contact and Miniature Relays". The Bell System Technical Journal. 1964. ^ "Safety Compendium, Chapter 4 Safe control technology" (PDF). p. 115. ^ Section 1.6, Engineers' Relay Handbook, 5th ed, Relay and Switch Industry Association, Arlington, VA; 3rd ed, National Association of Relay Manufacturers, Elkhart Ind., 1980; 2nd Ed. Hayden, New York, 1966; large parts of the 5th edition are on line here Archived 2017-07-05 at the Wayback Machine. ^ a b Alexandrovich, George. "The Audio Engineer's Handbook" (PDF). Db: The Sound Engineering Magazine. September 1968: 10. ^ EN 50005:1976 "Specification for low voltage switchgear and controlgear for industrial use. Terminal marking and distinctive number. General rules." (1976). In the UK published by BSI as BS 5472:1977. ^ "Relay Automatic Telephone Company". Retrieved October 6, 2014. ^ "British Telecom History 1912-1968". Retrieved October 8, 2014. ^ a b "Arc Suppression to Protect Relays From Destructive Arc Energy". Retrieved December 6, 2013. ^ Varney, Al L. (1991). "Questions About The No. 1 ESS Switch". ^ "Lab Note #105: Contact Life — Unsuppressed vs. Suppressed Arcing". Arc Suppression Technologies. April 2011. Retrieved October 9, 2011. The 4 × 400 metres relay or long relay is an athletics track event in which teams consist of four runners who each complete 400 metres or one lap. It is traditionally the final event of a track meet. At top class events, the first 500 metres is run in lanes. Start lines are thus staggered over a greater distance than in an individual 400 metres race; the runners then typically move to the inside of the track. The slightly longer 4 × 440 yards relay was formerly run British and American meetings, until metrication was completed in the 1970s. Relay race runners typically carry a relay baton which they must transfer between teammates. Runners have a 20 m box (usually marked with blue lines) in which to transfer the baton. The first transfer is made within the staggered lane lines; for the second and third transfers, runners typically line up across the track despite the fact that runners are usually running in line on the inside of the track. This prevents confusion and collisions during transfer. Unlike the 4 × 100 m relay, runners in the 4 × 400 typically look back and grasp the baton from the incoming runner, due to the fatigue of the incoming runner, and the wider margins allowed by the longer distance of the race. Consequently, disqualification is rare. As runners have a running start, split times cannot be compared to individual 400 m performances. Internationally, the U.S. men's team has dominated the event, but have been challenged by Jamaica in the 1950s and Britain in the 1990s. The current men's Olympic champions are from the United States. Mixed-gendered 4 × 400 metres relays were introduced at the 2017 IAAF World Relays, but the IAAF has yet to recognize any world records in that event. A broadcast relay station, also known as a satellite station, relay transmitter, broadcast translator (U.S.), re-broadcaster (Canada), repeater (two-way radio) or complementary station (Mexico), is a broadcast transmitter which repeats (or transponds) the signal of a radio or television station to an area not covered by the originating station. It expands the broadcast range of a television or radio station beyond the primary signal's original coverage or improves service in the original coverage area. The stations may be (but are not usually) used to create a single-frequency network. They may also be used by an FM or AM radio station to establish a presence on the other band. A re-broadcaster may be owned by a community group, rather than the owner of the primary station. WHLS/WHLX in Port Huron, Michigan purchased a translator and switched to an alternative rock format shortly afterwards without mentioning the original FM translator, except for its legally required top-of-the-hour ID. No AM frequencies have been mentioned. The high frequency radio waves used for telecommunications links travel by line of sight and so are obstructed by the curve of the Earth. The purpose of communications satellites is to relay the signal around the curve of the Earth allowing communication between widely separated geographical points. Communications satellites use a wide range of radio and microwave frequencies. To avoid signal interference, international organizations have regulations for which frequency ranges or "bands" certain organizations are allowed to use. This allocation of bands minimizes the risk of signal interference. Deutsche Welle (German pronunciation: [ˈdɔʏtʃə ˈvɛlə]; "German wave" in German) or DW is Germany's public international broadcaster. The service is available in 30 languages. DW's satellite television service consists of channels in English, German, Spanish, and Arabic. While funded by the German government, the work of DW is regulated by the Deutsche Welle Act, meaning that content is intended to be independent of government influence. DW is a member of the European Broadcasting Union (EBU). DW offers regularly updated articles on its news website and runs its own center for international media development, DW Akademie. The broadcaster's stated goals are to convey Germany as a "liberal, democratic state based on the rule of law", to produce reliable news coverage and to provide access to the German language.DW has been broadcasting since 1953. It is headquartered in Bonn, where its radio programmes are produced. Television broadcasts are produced almost entirely in Berlin. Both locations create content for DW's news website. The Fiat Ducato is a light commercial vehicle developed by the Sevel joint venture between Fiat and PSA Peugeot Citroën, produced since 1981. It was also sold as the Citroën C25, Peugeot J5, Alfa Romeo AR6 and Talbot Express for the first generation, while the second and third generations are marketed as the Fiat Ducato, Citroën Jumper, and Peugeot Boxer. It entered the Canada and United States markets as the Ram ProMaster for the 2014 model year. In Europe, it is produced at the Sevel Sud factory, in Atessa, Italy. It has also been produced at the Iveco factory in Sete Lagoas, Brazil, at the Karsan factory in Akçalar, Turkey, at the Lotus factory in Iran, at the Fiat Chrysler Automobiles Saltillo Truck Assembly Plant in Saltillo, Mexico, and at the Fiat-Sollers factory in Elabuga, Russia. Since 1981, more than 2.6 million Fiat Ducatos have been produced. The Ducato is the most common motorhome base used in Europe; with around two thirds of motorhomes using the Ducato base. Freestyle is a category of swimming competition, defined by the rules of the International Swimming Federation (FINA), in which competitors are subject to few limited restrictions on their swimming stroke. Freestyle races are the most common of all swimming competitions, with distances beginning with 50 meters (50 yards) and reaching 1500 meters (1650 yards), also known as the mile. The term 'freestyle stroke' is sometimes used as a synonym for 'front crawl', as front crawl is the fastest swimming stroke. It is now the most common stroke used in freestyle competitions. The IAAF World Relays is an international biennial track and field sporting event where teams from around the world compete in relay races, some of which are not part of the standard Olympic programme. The first three editions were set to take place in Nassau, Bahamas at the Thomas Robinson Stadium in 2014, 2015 and 2017. Originally intended as an annual event, it was later decided to happen every odd year, the same as the IAAF World Championships in Athletics for which it serves as a qualification stage. The competition format for the first edition included the 4 × 100 metres relay, the 4 × 200 metres relay, the 4 × 400 metres relay, the 4 × 800 metres relay and the 4 × 1500 metres relay. The first edition had a $1.4 million prize fund. From the second edition, the 4 × 1500 metres relay was replaced by the distance medley relay. However, this was short-lived and was itself replaced by a mixed-gender 4 × 400 metres relay.The 2019 IAAF World Relays are to be held in Yokohama, Japan. Internet Relay Chat (IRC) is an application layer protocol that facilitates communication in the form of text. The chat process works on a client/server networking model. IRC clients are computer programs that users can install on their system or web based applications running either locally in the browser or on 3rd party server. These clients communicate with chat servers to transfer messages to other clients. IRC is mainly designed for group communication in discussion forums, called channels, but also allows one-on-one communication via private messages as well as chat and data transfer, including file sharing.Client software is available for every major operating system that supports Internet access. As of April 2011, the top 100 IRC networks served more than half a million users at a time, with hundreds of thousands of channels operating on a total of roughly 1,500 servers out of roughly 3,200 servers worldwide. IRC usage has been declining steadily since 2003, losing 60% of its users (from 1 million to about 400,000 in 2012) and half of its channels (from half a million in 2003). The world records in swimming are ratified by FINA, the international governing body of swimming. Records can be set in long course (50 metres) or short course (25 metres) swimming pools. FINA recognises world records in the following events for both men and women, except for the mixed relays, where teams consist of two men and two women, in any order. Medley is a combination of four different swimming styles—butterfly, backstroke, breaststroke, and freestyle—into one race. This race is either swum by one swimmer as individual medley (IM) or by four swimmers as a medley relay. Michael Duane Johnson (born September 13, 1967) is a retired American sprinter. In the span of his career, he won four Olympic gold medals and eight World Championships gold medals. He formerly held the world and Olympic records in the 200 m and 400 m, as well as the world record in the indoor 400 m. He also once held the world's best time in the 300 m. Johnson is generally considered one of the greatest and most consistent sprinters in the history of track and field.Johnson is the only male athlete in history to win both the 200 metres and 400 metres events at the same Olympics, a feat he accomplished at the 1996 Summer Olympics in Atlanta. Johnson is also the only man to successfully defend his Olympic title in the 400 m, having done so at the 2000 Summer Olympics in Sydney. Aside from his Olympic success, Johnson accumulated eight gold medals at the World Championships, and is thus tied with Carl Lewis for the second most gold medals won by a runner (second only to Usain Bolt).Johnson's stiff upright running position and very short steps defied the conventional wisdom that a high knee lift was necessary for maximum speed. As of 2012, Johnson holds 13 of the top 100 times for the 200 metres and 27 of the top 100 times for the 400 metres. Of those, he holds 14 of the top 25 times for the 400 metres. He broke 44 seconds for the 400 metres twenty-two times, more than twice as many times as any other athlete. Johnson currently holds the national records for the 200, 300 and 400 metres. The 4 x 400 metres relay world record was anchored by Johnson. Michael Fred Phelps II (born June 30, 1985) is an American retired competitive swimmer and the most successful and most decorated Olympian of all time, with a total of 28 medals. Phelps also holds the all-time records for Olympic gold medals (23), Olympic gold medals in individual events (13), and Olympic medals in individual events (16). When he won eight gold medals at the 2008 Beijing Games, Phelps broke fellow American swimmer Mark Spitz's 1972 record of seven first-place finishes at any single Olympic Games. At the 2004 Summer Olympics in Athens, Phelps had already tied the record of eight medals of any color at a single Games by winning six gold and two bronze medals. At the 2012 Summer Olympics in London, Phelps won four gold and two silver medals, and at the 2016 Summer Olympics in Rio de Janeiro, he won five gold medals and one silver. This made him the most successful athlete of the Games for the fourth Olympics in a row.Phelps is the long course world record holder in the men's 100 meter butterfly, 200 meter butterfly, and 400 meter individual medley as well as the former long course world record holder in the 200 meter freestyle and 200 meter individual medley. He has won 82 medals in major international long course competition, of which 65 were gold, 14 silver, and 3 bronze, spanning the Olympics, the World Championships, and the Pan Pacific Championships. Phelps's international titles and record-breaking performances have earned him the World Swimmer of the Year Award eight times and American Swimmer of the Year Award eleven times, as well as the FINA Swimmer of the Year Award in 2012 and 2016. Phelps earned Sports Illustrated magazine's Sportsman of the Year award due to his unprecedented Olympic success in the 2008 Games. After the 2008 Summer Olympics, Phelps started the Michael Phelps Foundation, which focuses on growing the sport of swimming and promoting healthier lifestyles. Phelps retired following the 2012 Olympics, but he made a comeback in April 2014. At the 2016 Summer Olympics in Rio de Janeiro, his fifth Olympics, he was selected by his team to be the flag bearer of the United States at the 2016 Summer Olympics Parade of Nations. He announced his second retirement on August 12, 2016, having won more medals than 161 countries. He is often considered the greatest swimmer of all time. Microwave transmission is the transmission of information by microwave radio waves. Although an experimental 40-mile (64 km) microwave telecommunication link across the English Channel was demonstrated in 1931, the development of radar in World War II provided the technology for practical exploitation of microwave communication. In the 1950s, large transcontinental microwave relay networks, consisting of chains of repeater stations linked by line-of-sight beams of microwaves were built in Europe and America to relay long distance telephone traffic and television programs between cities. Communication satellites which transferred data between ground stations by microwaves took over much long distance traffic in the 1960s. In recent years, there has been an explosive increase in use of the microwave spectrum by new telecommunication technologies such as wireless networks, and direct-broadcast satellites which broadcast television and radio directly into consumers' homes. The Olympic flame is a symbol used in the Olympic movement. Several months before the Olympic Games, the Olympic flame is lit at Olympia, Greece. This ceremony starts the Olympic torch relay, which formally ends with the lighting of the Olympic cauldron during the opening ceremony of the Olympic Games. The flame then continues to burn in the cauldron for the duration of the Games, until it is extinguished during the Olympic closing ceremony. A relay race is a racing competition where members of a team take turns completing parts of racecourse or performing a certain action. Relay races take the form of professional races and amateur games. Relay races are common in running, orienteering, swimming, cross-country skiing, biathlon, or ice skating (usually with a baton in the fist). In the Olympic Games, there are several types of relay races that are part of track and field. Usain St Leo Bolt (; born 21 August 1986) is a Jamaican retired sprinter. He also is a world record holder in the 100 metres, 200 metres and 4 × 100 metres relay. His reign as Olympic Games champion in all of these events spans three Olympics. Owing to his achievements and dominance in sprint competition, he is widely considered to be the greatest sprinter of all time.A nine-time Olympic gold medalist, Bolt won the 100 m, 200 m and 4 × 100 m relay at three consecutive Olympic Games, although he lost the 2008 relay gold medal about nine years after due to a teammate's doping disqualification. He gained worldwide fame for his double sprint victory in world record times at the 2008 Beijing Olympics, which made him the first person to hold both records since fully automatic time became mandatory. Bolt is the only sprinter to win Olympic 100 m and 200 m titles at three consecutive Olympics (2008, 2012 and 2016). An eleven-time World Champion, he won consecutive World Championship 100 m, 200 m and 4 × 100 metres relay gold medals from 2009 to 2015, with the exception of a 100 m false start in 2011. He is the most successful athlete of the World Championships, was the first athlete to win four World Championship titles in the 200 m and is the joint-most successful in the 100 m with three titles. Bolt improved upon his second 100 m world record of 9.69 with 9.58 seconds in 2009 – the biggest improvement since the start of electronic timing. He has twice broken the 200 metres world record, setting 19.30 in 2008 and 19.19 in 2009. He has helped Jamaica to three 4 × 100 metres relay world records, with the current record being 36.84 seconds set in 2012. Bolt's most successful event is the 200 m, with three Olympic and four World titles. The 2008 Olympics was his international debut over 100 m; he had earlier won numerous 200 m medals (including 2007 World Championship silver) and holds the world under-20 and world under-18 records for the event. His achievements as a sprinter have earned him the media nickname "Lightning Bolt", and his awards include the IAAF World Athlete of the Year, Track & Field Athlete of the Year, BBC Overseas Sports Personality of the Year (three times) and Laureus World Sportsman of the Year (four times). Bolt retired after the 2017 World Championships, when he finished third in his last solo 100 m race, opted out of the 200m, and pulled up in the 4×100m relay final. Stating that it was his "dream" to play professional association football, in August 2018 Bolt began training with Australian football A-League club the Central Coast Mariners as a left-winger. On 12 October 2018, Bolt scored twice for the team in a friendly match.